Is the Virtual World Really An Escape from Reality? Or are they on a collision course? One of the most popular and successful genres of gaming is the role-playing game (RPG). In an RPG, the player is a character in a usually fantasy world, and is able to develop skills and abilities within that world to progress as a character. In the virtual world, one could grow more powerful or more wise, and take on more difficult obstacles. Traditionally, these role-playing games—and in fact, all commercial video games—were played as an escape from reality. One could escape the loud, busy, modern world and live instead in a quiet, simple, and perhaps peaceful world. Screenshot from the game World of Warcraft. One of the strongest effects of these games was to cause players to disregard socioeconomic stratification that existed in the real world. In the virtual worlds of RPG’s, everyone starts equal and has the same opportunities. The anonymity of online gaming meant that players could ignore social and economic barriers in real life, and feel accomplished by themselves. The face of gaming was forever changed by Facebook. Instead of playing with anonymous players from all around the country, and even all around the world, players of Facebook games play with their real-life friends. Screenshot from Farmville. Courtesy of Wikipedia Commons. Moreover, many Facebook games have microtransactions, where players can pay real money to gaming companies in exchange for virtual goods or virtual currencies. In “older” style RPG’s, on the other hand, all currencies are in-game only and there is no legal exchange between virtual money and real money. Real money is now able to affect your character’s position in the virtual world. It doesn’t take a genius to see where this is headed: into socioeconomic stratification in the virtual world, which was supposed to be the one place where players could escape from real world problems. That is, in classic RPG’s, more successful players could attribute their victories to skill, knowledge, and effort. But in microtransaction-based games, the more successful players could be attributed to just being wealthier in the real world. Even in these microtransaction-based games on Facebook, the microtransactions can be thought of in terms of a state-controlled economy. Almost always, the company itself determines the prices of all virtual goods or currencies, and the company itself is the seller of goods. Zynga and Nexon are two examples of this. Activision Blizzard took the idea of microtransactions one step further, and created a capitalist economy, where the players themselves sell goods to each other, while the company obtains a 15% tax on each virtual good sold. 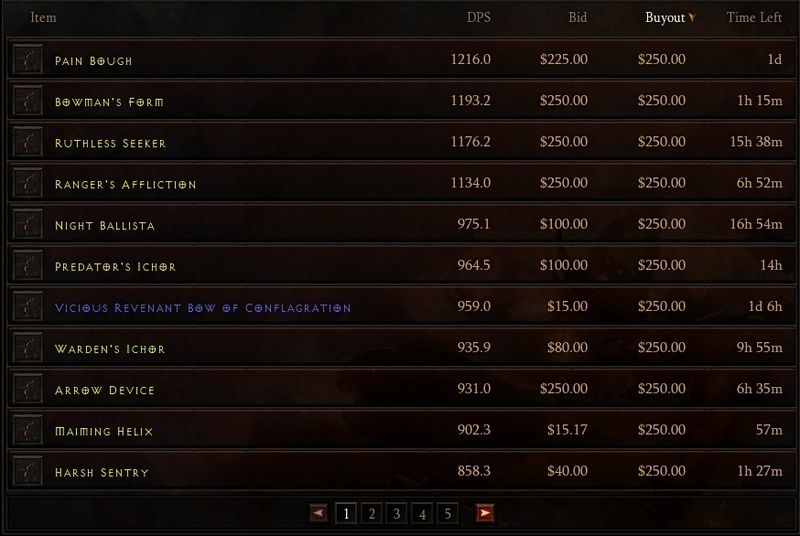 Screenshot of the Real Money Auction House in Diablo 3. The $250 buyout is the max limit. In the classic microtransaction models where every player who buys a particular item pays the same amount, no player feels ripped off or feels that the system is unfair. But in the Real Money Auction House model, one player might buy a near identical good for half the price that another player paid, perhaps because the first player had carefully studied the market and compared options more carefully. The second player ends up feeling ripped off. In this free market virtual economy, the stratification arising from unregulated capitalism has taken effect. Again, one doesn’t need to read Karl Marx to see what is going on in this virtual economy. The rich are getting richer by buying goods cheap and then reselling them for higher values, while the poor find it very difficult to start off. The poor have essentially turned into a working class. The Diablo 3 economy is very much akin to that of Industrial Revolution Britain. The virtual world began as an escape from reality, then transformed into a mirror of current reality, and then mutated again to a history of human reality. If it continues down this path, then the virtual world of the future is not going to be the virtual world we saw in our dreams. What we imagined virtual reality to be. It will not be a place where we can set aside our real world and escape our problems for a few hours. It will not be a place where we have fun or meet people we would never see otherwise and talk about the little things in life without worrying about our financial position. Instead, it will be an extension of the real world and everything in it. Those who are wealthier in the real world will have more options in the virtual world, and those who are poorer will remain poor. Ultimately, if virtual reality does not return to its roots as an escape from reality, people will end up escaping the virtual world as well. Previous Post Is the Afterlife the Only Motivation? Hmmm, I’m not sure that they [virtual reality economies] can be separated now. When WoW first sprung up, it was a meritocracy, the more one grinds goblins, the more xp, the more gold etc… But then, a black market formed and affluent kids bought fully loaded characters. Two novels explore this idea: Neal Stephenson’s Reamde and Ernest Cline’s Ready Player One. In both fictional MMORPGs, a black market economy developed allowing “the haves” to level up quicker. I think that even with the black market, WoW is still largely a meritocracy. The best goods can only be obtained through in-game content and cannot be traded, thus it is impossible for the black market to provide the highest level items (except for the buying of whole accounts, but this is largely unsatisfying compared to building up a character on one’s own). Diablo 3 is completely different because the best items can be legally traded at will, and it is even encouraged to trade at large volumes. The end result is that the newer virtual worlds just feel like extensions of real world socioeconomics. If the trend continues, some of the crazier things you linked in those novels might no longer be science fiction, and instead describe the real world and its interaction with the virtual world quite accurately. But you raise a good point about the idea of the meritocracy. Perhaps games like WoW are popular because they are the closest to a meritocracy people can actually find; perhaps they represent some ideal utopian fantasy that we in the real world can never have. Ah, I think I understand the difference now, but now I don’t think I agree with you 🙂 The problem with new economies, like Diablo 3 and Bitcoin, is that early adopters are incredibly favored. The initial Diablo 3 l33ts grab the top loot and start selling it to the n00bs, but I think with a max buyout price, all items will eventually drift such that min bid = buyout price. That was already happening in your picture. Yep it is different. People can try to resist using the socioeconomic features of a game, but as long as some people do use them, the system is going to be affected by the real world. man started to compare physiotherapy to hairdressers and was extraordinarily annoying and rude.